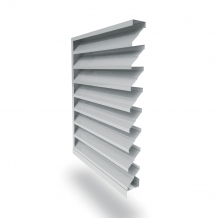 Powered by nature and designed with architectural requirements in mind, Airocle’s range of fixed louvres offer sustainable yet effective ventilation solutions for your commercial, industrial and residential buildings Technologically researched and leading the way in terms of sustainability, Airocle’s fixed louvres will not only make your building attractive, but will also offer a reliable and highly cost effective ventilation solution. 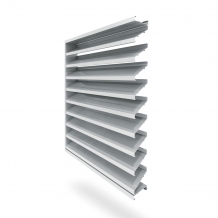 Optimum Constant Airflow: Whether you need an inlet for fresh air or an outlet for used air, our fixed louvers provide a secure system optimising maximum and constant airflow naturally in your roof, walls doors or screens. 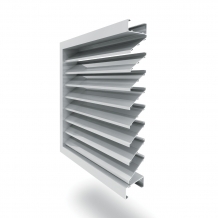 Weather protection: While maximising sunlight and optimising airflow, our highly resilient and solid fixed louvers are ideal where greater weather exposure is an issue. 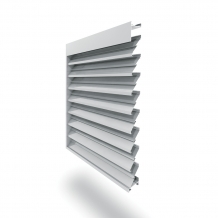 Screening: Not only is fixed louvre ventilation used for airflow, our aesthetically pleasing and custom designed products can be use for either privacy screening or to cover your unsightly equipment or plant rooms. We can specifically design to enhance the facade of your structure. Security: By using the highest quality of products, Airocle prioritises security while allowing maximum ventilation for all your facilities. Our perforated sheet metal will protect your structure from large insects, birds and other vermin and doors and grilles are impenetrable. © IVR Group Pty Ltd, trading as Airocle.